To pull off that perfect surprise, or to make your loved ones smile, we’re here to make sure your flower delivery anywhere in Sydney arrives with care. We offer an efficient and friendly delivery service with our trusted team of couriers. Each one is an expert in handling our blooms so that they arrive in immaculate condition. Plus, we constantly get feedback that our couriers are so friendly and nice that they add to the joy and delight of receiving a Pure Flowers bouquet. 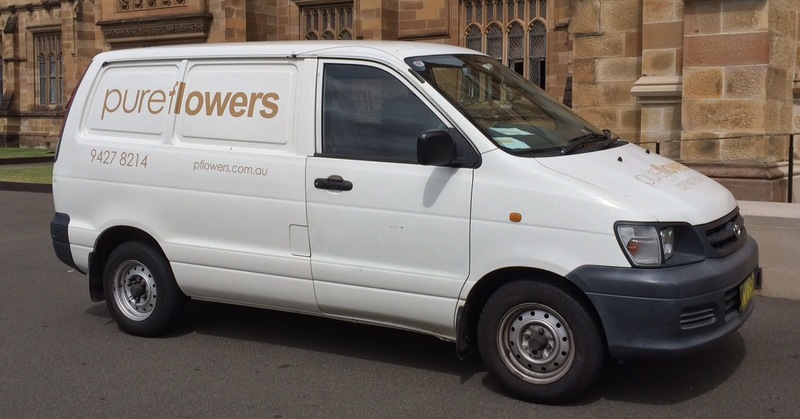 Where do we deliver flowers in Sydney? A short answer to this one is… all Sydney suburbs! For Sydney orders, browse through our bouquets, arrangements and gifts to surprise and delight your loved one. For rural, interstate or overseas requests, please get in touch. From our Lane Cove boutique, where we handcraft each bouquet and lovingly hand-write each card, we can organise delivery around the corner in Lane Cove, Longueville and Riverview. Macquarie Park Cemetery and Crematorium. You are welcome to order your flowers online, in store or simply call +61 (0)2 9427 8214. Plus, we arrange to have our flowers delivered right across Sydney from the Sydney CBD to Northern Beaches; Eastern suburbs to the Inner West; and Western suburbs to South-West Sydney. Whether you order is local, interstate or from overseas, including the USA, UK, Canada, Singapore and New Zealand our award winning team with create your beautiful floral gift. Delivery Fees: quotes are provided when you order online and are based on delivery distance from our Lane Cove boutique. Select your product, enter the shipping details and the delivery fee will be calculated based on the recipient's address. Delivery Times: apologies, but we cannot guarantee a specific delivery time. We aim to deliver to businesses by 5pm and to residential addresses by 7pm. For school deliveries, please order 24 hours in advance to allow delivery by 3pm on a requested day. Delivery Instructions: please advise any special instructions when you order. For example, for a business address, do the flowers need to be left at Reception? Or the mailroom? For residential addresses, can the bouquet be left on the verandah? Or by the back door? Be as specific as possible as if the courier is unable to leave the delivery, it will be returned to the store and a redelivery fee may apply. We look forward to delivering your beautiful blooms in Sydney!